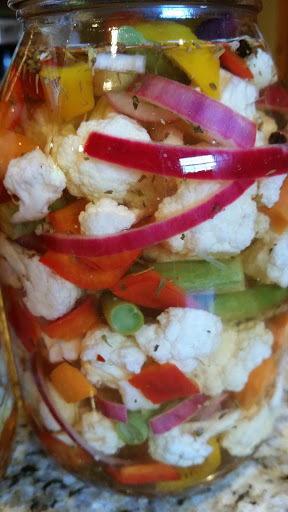 I first had giardiniera at a little Italian restaurant in Los Angeles many years ago. Honestly, I ate so much of it after that that I quit eating it for a very long time. If you enjoy raw veggie salads or pickles, you will love this. It’s wonderful as a side dish, snack, or even on sandwiches. Prepare the vegetables and put them in a large bowl. Toss to combine. Oh, look! A handful of fresh green beans from the garden hopped into my bowl! Bring the vinegar, water, sugar, salt, and peppercorns to a boil, reduce heat, and simmer for 2-3 minutes. 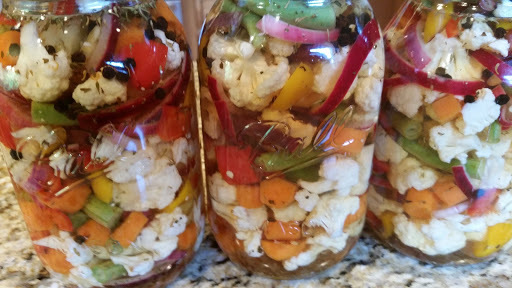 Place the vegetables into 2 quart sized canning jars. Add 2 cloves of garlic, 1/2 teaspoon basil, and 1/2 teaspoon oregano to each jar. Look how gorgeous this is! I ended up with 3 jars and had to adjust the liquids, but I’m not complaining.